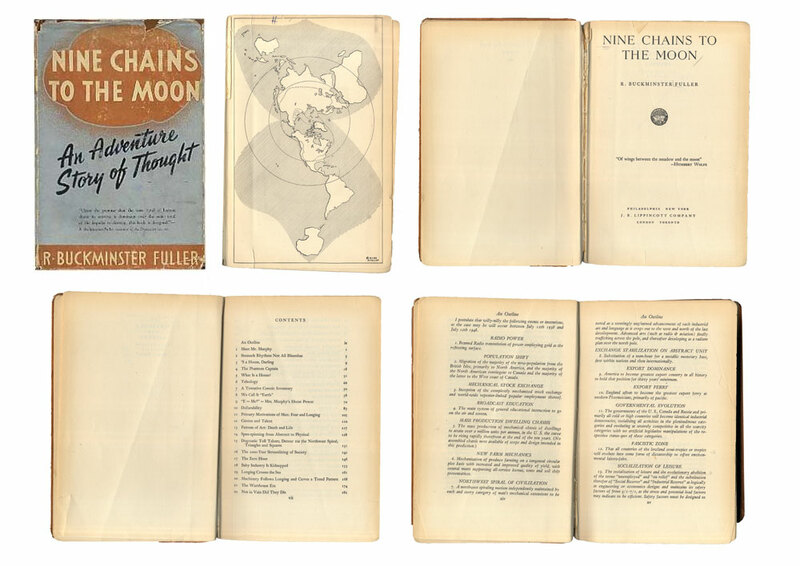 Nine Chains to the Moon is the second book project by Buckminster Fuller, published in 1938. My "redesign" project was inspired by Fuller's dedication of the book to his daughters. "Your strange divinity still kept" comes from a lovely little poem by Christopher Morley, entitled "To a Child." Upon researching more, I learned that Fuller was in fact extremely fond of children, and, in particular, a child's ability to look at the world with fresh, untainted eyes -- "unselfconscious as the bee." Though Fuller's text reads somewhat, well, aggressively, his underlying themes are quite optimistic. He often uses words in ways that actually turn them on their heads, as though he is fed up after too many years of our human corruption of the english language, and is taking it upon himself to do what must be done. For my version of the book, I combed through Nine Chains, collecting 1) instances where Fuller questions and reinterprets words and concepts that the reader thinks (s)he already understands, and 2) instances where he creates brand new words and concepts altogether. Culled together, they became the Nine Chains to the Moon - An Alphabet Book of Thought, intended for children of any age to relearn the words and ideas we thought we knew -- but were wrong! Fuller's name of the book gets at yet another optimistic underpinning of its content: that it is up to us humans to do as much as we can with as little as we can. Nine is the number of chains we (the entire world's population, in 1938) could form to the moon and back, when standing on one another's shoulders. Fuller uses it as an example to describe how if we consider our resources differently, we can imagine new possibilities. I'm very happy to report that I had the privilege of speaking to Fuller's daughter, Allegra Snyder Fuller, and that she is enjoying her newly-updated copy of her father's book.